You will find a lot of debate out there on where the best pizza in the world is. Is it Rome or Naples? Maybe the dollar slices in NYC get your vote! Popolinos in Manchester was a favourite student haunt for us at 4am. Or maybe the deep dish crust that Chicago is famous for is calling your name. Whilst Rome will always come out top for me, Chicago deep dish is a close second. 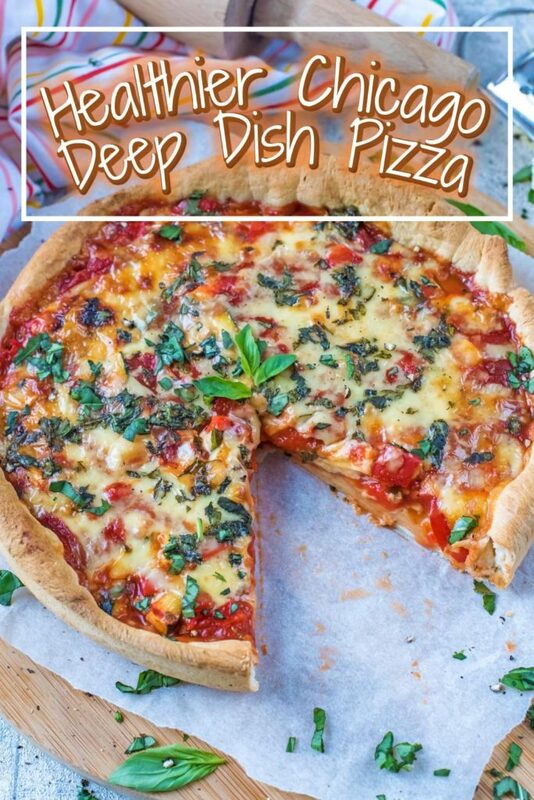 Do you want to be kept up to date on more delicious recipes like this Healthier Chicago Deep Dish Pizza? Please subscribe to the blog mailing list (it takes 30 seconds). You will get sent the new recipes straight to your inbox. Your email address won’t be passed on to anyone and you will never be spammed. Why is this healthier? Well, portion size for a start. If you have eaten an authentic one of these in Chicago, you will know just how huge they are. This is a good size for 4 people with a side salad. We also went pretty easy on the cheese to keep it lower in calories. When I was in Chicago a few years ago, one of the things on the top my list to do whilst I was there was to eat a real deep dish pizza. I had tried the microwavable version you can get in our supermarkets in the UK, but it just doesn’t come close. I dumped my bags at the hostel and headed straight for the best rated deep dish restaurant. It didn’t disappoint! If you haven’t had it before, it is like an upside down pizza. Kind of. You put the cheese on the base first and then the toppings and then you top it with the tomato sauce – it’s genius. You have to try it to believe just how good it is. It’s the debated whether you finish with more cheese, but we did because how can you debate whether more cheese is an option or not? I remember sending a picture to Dave of the pizza I was eating over there (I know – I’m cruel) and after he said how jealous he was, I promised to make him one when I got home. Which I did. Still being very overweight then and not much of a cook, I didn’t make a healthier one – it was loaded with cheese and store bought dough. Dave reminded me of that pizza the other day and asked if I could make a healthier version of it. Challenge accepted! At the end of the day – it’s pizza. 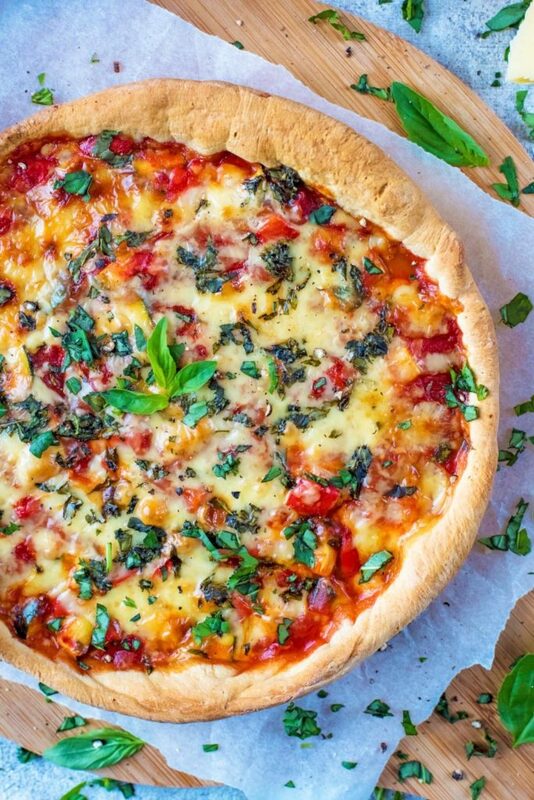 It is never going to be a health food or a food that I can eat in unlimited amounts But with a couple of small changes, like using whole wheat homemade dough and not going overboard on the cheese and packing it with veggies, it can be made a bit healthier. If there is one thing that Chicago is famous for, it’s their incredible deep dish pizza. 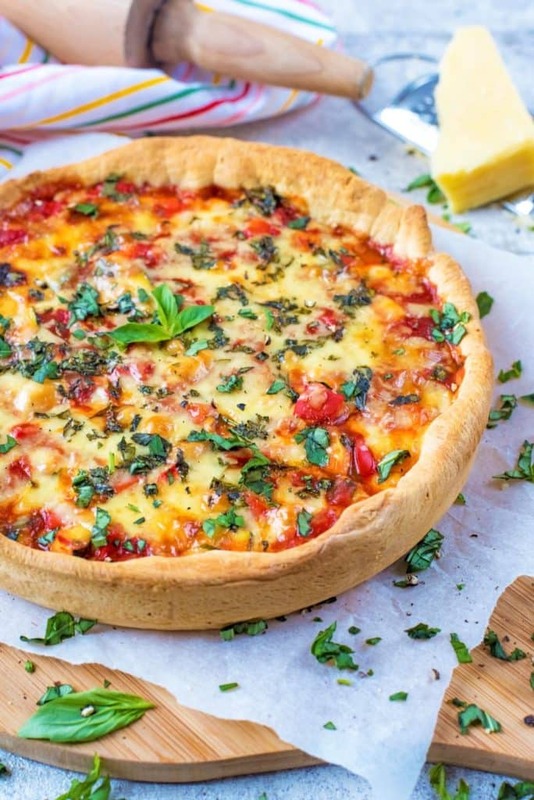 Use our easy recipe and grab yourself a homemade slice of Healthier Chicago Deep Dish Pizza. 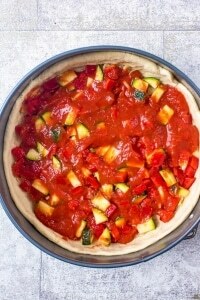 Make the pizza dough according to the recipe, roll it out so that it is a little wider than the pan you are using. I used a 10 inch diameter spring-form cake tin and it worked perfectly. 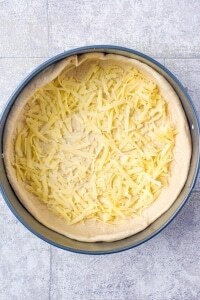 Put the dough in a greased tin and push the dough up the sides a little. Put half your grated cheddar on the bottom and then top with the courgette and bell pepper. Top with the marinara and then sprinkle with the extra cheese and the basil. Put in a preheated oven at 200°C for 35 minutes. Allow to cool for 10 minutes before serving to make it easier to cut. We have lots of other pizza recipes for you to try: Garlic Mushroom Pizza, Portobello Mushroom Pizza, French Bread Vegetable Pizza or Breakfast Pita Pizza. 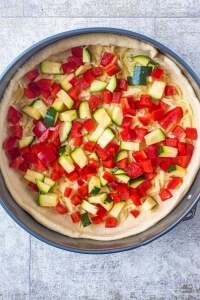 Healthier pizza you have my attention. This looks delicious and I don’t think I’ll miss the extra calories. 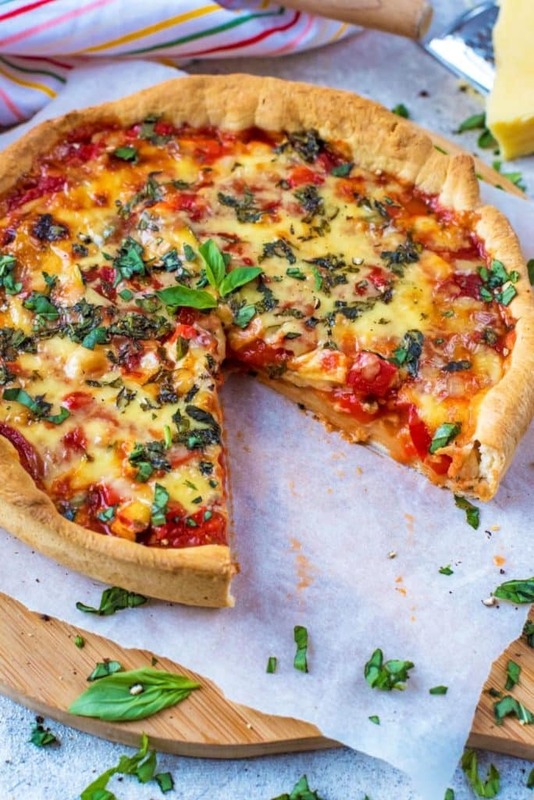 This deep dish pizza looks fabulous! I love that it’s healthier but it doesn’t look like it! Hubby probably loves pizza more than I do, which is saying a lot since I love it! So, I can’t wait to make your deep dish pizza and surprise him! He’s going to be so happy! Chicago is such a great food city. It’s funny that every time I go, I have such a bad case of FOMO, I have the hardest time deciding what to eat! Nice job making this healthier! 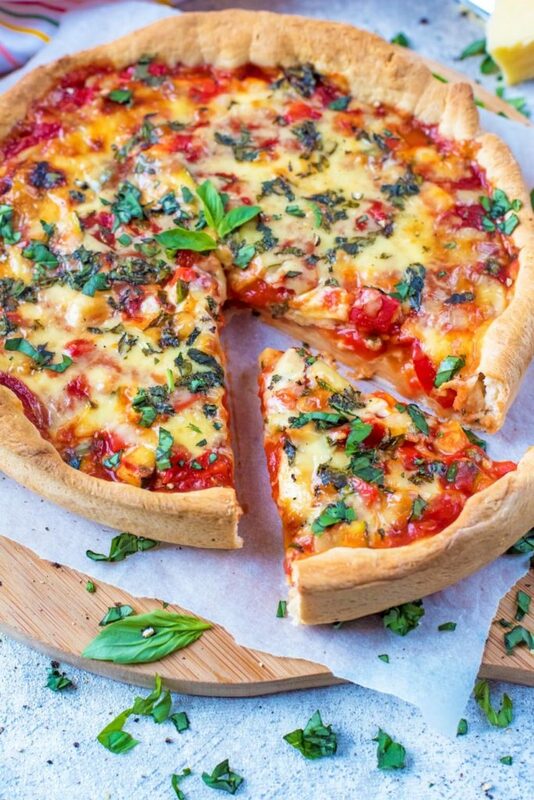 Wow this pizza looks insane, love that it’s made healthier too, even better! Wow, this looks so delicious! Beautiful presentation. Is good food and this looks like one of the BEST! I can’t WAIT to try this! Thank you for this great recipe! That is one good looking pizza. Some pepperoni would be a good addition in there too and I think my boys would love it. Definitely trying this one. 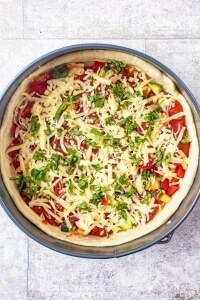 Oh I’m not sure I am brave enough to make my own pizza base, but this looks amazing. It actually looks like a pie. The colours are amazing! 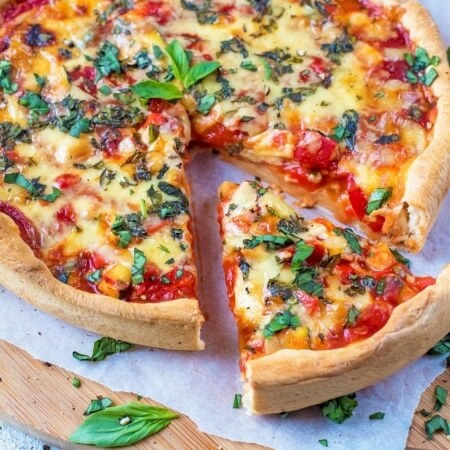 The pizza is mouthwatering -. You can’t beat a homemade pizza! Love the look of all that cheese too. This would be a perfect pizza for my kids to make some evening. I just started a new job with odd hours which leaves two teens getting creative with food. This looks much better than the watermelon malts they made this past week. Oh my goodness this look absolutely amazing! Its fantastic! One of my favs. Can’t wait to try this one. Thanks for the recipe! YUMMY!!! I love chicago style pizzas and this one is over the top delicious looking. I had my first one in Chicago this year and I am hooked! This looks super delicious! 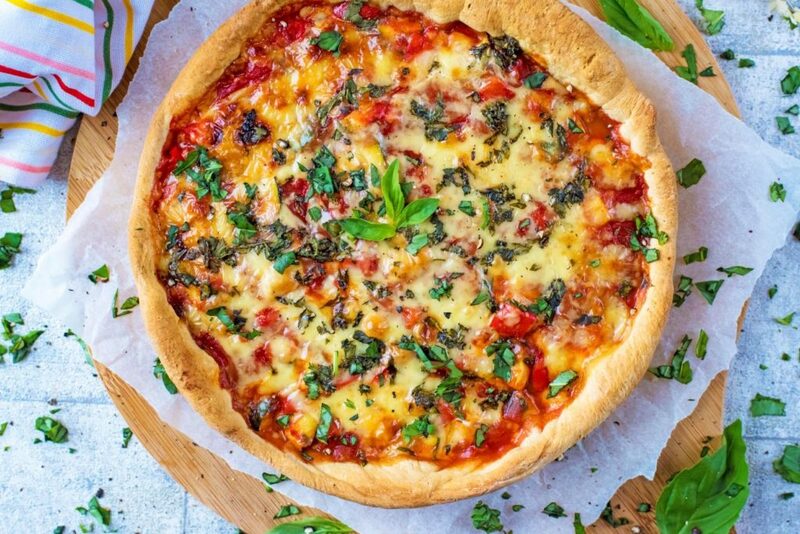 I am a big fan of deep dish pizzas but don’t have them too often as they are just too big and not too healthy, this looks like such a tasty healthier alternative. This looks so cheesy and comforting. It’s the last day of half term, so I think this would make a nice dinner to finish on. That’s such an awesome way of making a pizza. I love that the toppings are upside down and I always choose a nice thick base.